When asked how she feels, Kuppammal, with tears in her eyes, says that no one is around to help care for her. After losing her husband at an early age; she brought up her daughters alone until they got married and abandoned her. Sadly, in many parts of India today, widows and the elderly fall victim to abandonment. 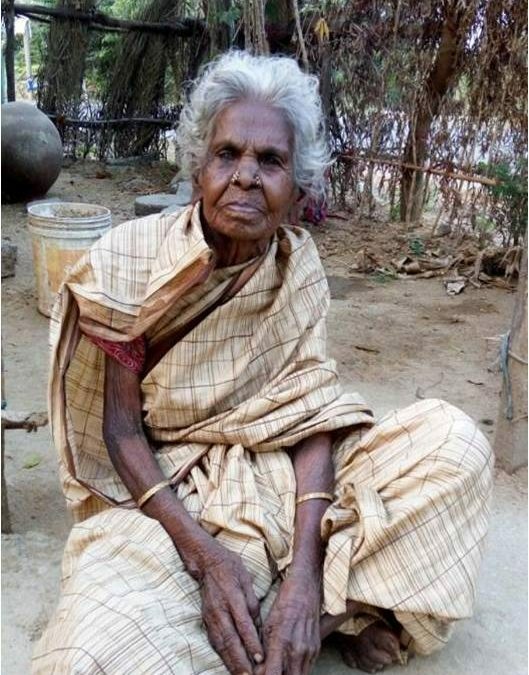 Tripura Foundation found Kuppammal living alone, without food and lacking clothes to protect her from the harsh weather. Fortunately, through HoPE for the Elderly, we were able to find her and provide for her needs. She has been taken care of ever since and is given monthly rations of food and clothing. Children from the nearby HoPE Learning Center now visit her regularly at home. Whenever someone spends time with her, Kuppammal talks about how she misses her daughters and wonders how many grandchildren she has. Over time, she has improved greatly in health and temperament. Kuppammal admits that she feels lonely at times, but she is also very grateful for the children who visit her each evening to tell her about their day in school and to listen to her many stories. She says that she treasures that time of day most of all. Kuppammal says that she is very grateful and prays for God to bless Tripura Foundation and its sponsors and children for taking care of her. By supporting HoPE for the Elderly and HoPE Learning Centers, you are making a real difference in the daily lives of real people like Kuppammal and the children who visit her. Please consider making a donation today. It costs just $40 per month to provide food, clothing, grooming items and human companionship to an elder in need!